The second installment in The Legend of Zelda series titled The Adventure of Link is often considered the black sheep of the family. Despite being one of the best-selling games in the entire series, many fans hate it and with good reason. The game is tough and I do mean tough. Very few gamers have the patience to sit through it and very few players have the skills to climb to the top of Death Valley, not to mention finishing the game. Anyone who has played Zelda II can tell you how difficult beating the simplest of enemies can be, nevermind the boss battles. Enemies like Fokka, Iron Knuckle, and Moblin might as well be final bosses because it takes a lot of fast reflexes to defeat each of these swashbuckling foes. Not only will you encounter them multiple times in each dungeon, but if you lose all of your lives (which you will), the game sends you all the way back to the start. And by that, I don’t mean the start of the dungeon that you were exploring, but the start of the entire game. Players must be prepared for repeated failure when sitting down to play Zelda II, but that is sort of what makes the game so great. The sense of accomplishment a player feels when finishing Zelda II is unmatched by any other game in the Zelda series. The Adventure of Link was a bold and radical departure for the series, but a brilliant one at that, and one of the greatest games ever made! The Adventure of Link is not only one of the five best games released on the Nintendo Entertainment System but the most punishing game of the 8-bit generation. It offers players one of the most engrossing gaming experiences available on the console and features some of the best boss battles the series has to offer. Be it Horsehead, Rebonack, Gooma, Carock, or Shadow Link (making his first appearance), each boss presents a unique style of battle and each has a specific weakness. 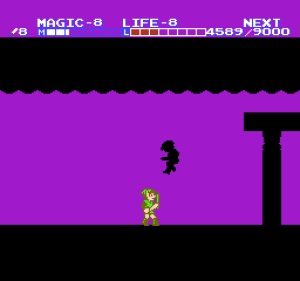 If you like extremely challenging combat that requires a high level of skill to complete, you will like Zelda II. It’s not just about swinging Link’s sword, it’s about precision, and counter-attacks. And for those of you who were told Shadow Link is the toughest of the bunch, you were lied to. He’s actually the easiest of all the enemies to defeat (the trick is to simply stand at the edge of the screen and keep swinging your sword). It’s not Shadow Link you need to worry about, but rather everything else especially when trekking up Death Valley, and finding your way through the labyrinth called the Great Palace where you must defeat the penultimate boss, a giant, winged creature named Thunderbird, who can’t be beaten unless you first find the “most powerful magic spell”, Thunder. The boss fights here provide some of the best the series has to offer and set a standard for the series moving forward. There is not one skill set that goes unused in Zelda II, whereas most other games in the series allow you to beat enemies by simply pressing one button repeatedly. There’s even a bit of a platforming aspect to the game, and you’ll find massive dungeons filled to the brim with tough enemies and lava pits that will instantly kill you if you fall into them. Most Zelda fans who claim to hate this series, hate it because they just can’t beat it, and it’s a shame that not everyone has the time or temperament to play through Zelda II because it really is a great game. Gamers with a high threshold for unpleasantness will get a contact high from Zelda II but no matter how much you struggle to complete the adventure when you do, you will appreciate everything the game has to offer. The Adventure of Link was an incredibly assured attempt to rewrite the rules of the entire series back in 1988. Unfortunately, most people just don’t like change and so because it was different, and harder than the original, many fans of the series unfairly ridicule it. Around the time of its release, there were several sequels of popular franchises that took a radically different approach from the first. Much like Castlevania II: Simon’s Quest and Super Mario Bros. 2, Zelda II is derided for its shift in direction. The game introduced elements such as Link’s “magic meter” and the Shadow Link character that would become commonplace in future Zelda games while role-playing elements such as experience points and the platform-style side-scrolling along with multiple lives were never used again in canonical games. Zelda II has more in common with the RPG genre, and earning experience points in three different areas (attack, defense, and magic) is one of the things that I love about the game. Link begins the game with four Heart Containers and four Magic Containers and can acquire up to four more of each, but unlike other Zelda games, every single form of attack Link usually enjoys is missing in this installment including the use of the bow, bombs, and the boomerang. In place of these, The Adventure of Link features eight spells for Link to use. Each spell is learned from a different wise man in one of the eight towns within Hyrule. Link must complete side-quests before they will teach him their spells. 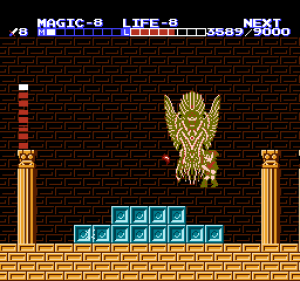 The casting spells mechanic is yet another innovation only seen in Zelda II and they play quite a big role, as several of them are needed to advance. In Zelda II our hero can use these spells to leap to great heights, throw fireballs, reflect magic, and yes, he can transform into one of the series’ signature little flying pixies. 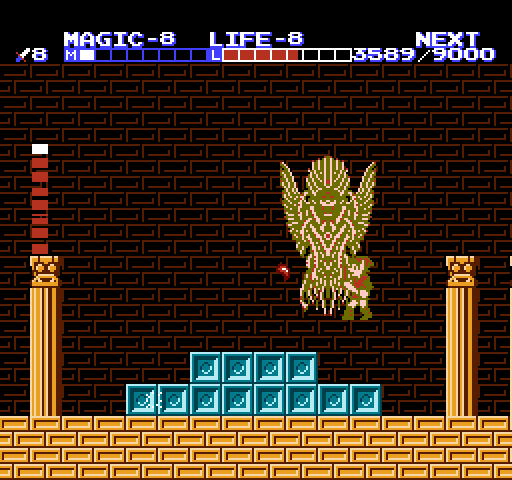 Fairy form even allows Link to fly through the keyholes of locked doors, bypassing the need to find keys in the game’s many dungeons. In terms of graphics and music, Zelda II is about on the same level as its predecessor but Zelda II also features a massive overworld map and most of the scholars in Ocarina of Time bear the same names as towns from The Adventure of Link (Rauru, Ruto, Saria, Nabooru, and Darunia). Beyond the towns, there are several secrets to discover and even a few scattered huts. In fact, this world is much larger than that of the first Zelda game and Koji Kondo’s soundtrack is just as good. And despite its quirks, Zelda II introduced a number of Zelda standards including a larger focus on storytelling, as well as sidequests. Yes it is difficult and yes it is different, but for better or for worse, that is what makes it stand out from all the other entries in the series. Zelda II is unique but frustrating – flawed but brilliant – and without question, an important game that helped define what the Zelda games would ultimately be. Zelda II might just be my favorite game in the NES library if only for its poetic ending, which makes the journey well worth your time. The Adventure of Link takes place at the very end of the timeline, long after The Skyward Sword, and it culminates by introducing us to Shadow Link (not to be confused with Dark Link), one of the most mysterious characters in the series. Shadow Link is the embodiment of fear within Link and here he replaces Ganon as the final test before the old wise man allows Link to use the Triforce of courage to awaken the sleeping princess. The Adventure of Link has real passion, real emotion, real terror, and a tactile sense of evil. I’ve beaten this game twice, and both times I left physically, emotionally and mentally exhausted; but I also left happy and intoxicated. The Adventure of Link is a nerve-jangling, pixel wasteland populated with images of beauty and horror, waylaid only by its one true flaw – forcing you to start at the very beginning should you die. Still, Zelda II has stood the test of time astonishingly well. An unqualified triumph, Zelda II deserves far more respect.